That time you fell in love with a giant pink elephant. For the first few days of our holiday, all we heard was: “Elle-fant. Pink.” Followed by a desolate: “Gone”. As I was checking us in, a giant pink elephant happened to walk by the car where everyone else was waiting and it was apparently love at first sight – on Freya’s side anyway. When she was still looking forlornly out of the caravan’s huge front window repeating those words the following day (she had been to sleep, don’t worry), my mum and dad kindly bought her a lovey version of what we discovered was one of the camp characters, Anxious the Elephant, from the on-site shop, which helped a little. Then on Wednesday we went to one of the free children’s activities and who happened to appear on stage? Anxious! I wish you could have seen Freya’s face, it was a picture of delight and awe. At the end of the fun baby sensory session, there was the chance to go up on stage and have a photo taken (also for free). Last year when we did this she clung to me and I have a lovely set of pictures of me smiling with various characters and Freya looking horrified. This year as we walked up the steps I could feel her trying to disengage my hand. As soon as it was our turn I let go and she didn’t just run, she sprinted over and flung herself at poor unsuspecting Anxious, burying her head in its/her fur. It was so unexpected that my mum forgot to take a photo and my husband only did so at the last minute. I stood to one side not quite believing what I was seeing. Freya is generally quite sociable but I’ve never seen such love, especially for a pink elephant three times her size. While my heart soared at her independence, there was a little tinge of “oh, my baby is growing up” mixed in too. I’m pretty sure, right then, was the moment of the holiday for Freya. She loved swimming, playing on the beach and the daily visits to the various playgrounds dotted about the site but it always came back to Anxious. “Elle-fant. Huggin.” She would say over and over with a happy little smile on her face. I’m a bit sad that she won’t remember it in years to come. Some of my earliest memories are from holidays but I suspect there are others that I think I remember but really it’s only because they are family stories told over and over. First love is the sweetest thing, although I wonder how well I will deal with it when an actual person is the subject of her affections? So that’s Freya’s holiday summed up but what about the rest of us? A post to follow. Previous postI packed my bag and in it I put… mostly food. Martha fell in love with it too, but thankfully without seeing the walking version – she’s terrified of people in costume. Freya has never been a fan before (and didn’t like any of the other characters). It must be something about pink elephants. Hehe. Aww how lovely. Did you mind children flinging themselves at you? We were all wondering how she saw as there didn’t seem to be any eye holes? 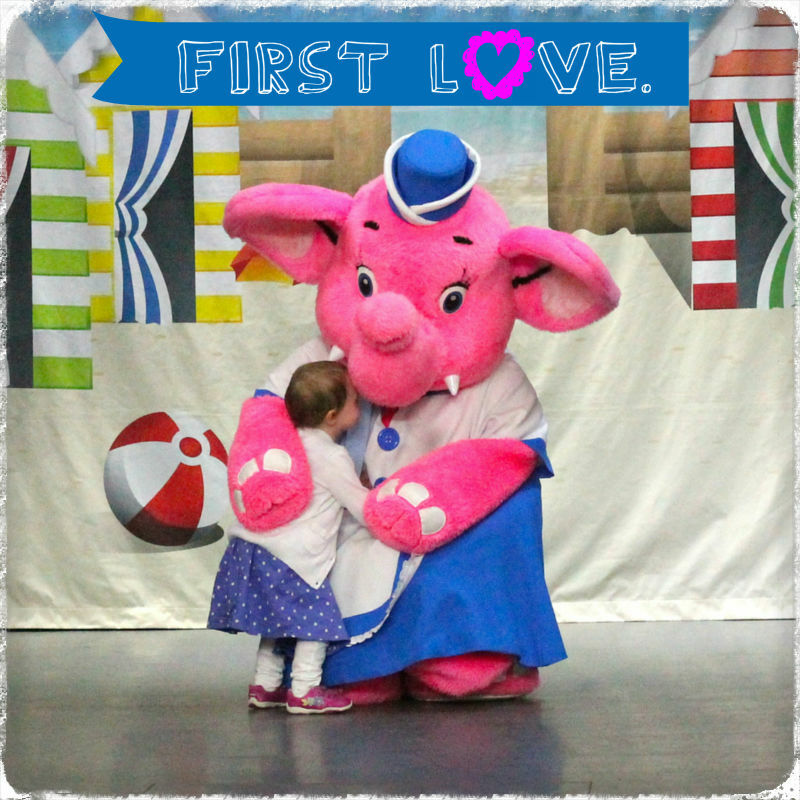 Awww… Freya sounds like such a cutie, and why not fall for a large pink elephant!!! She’s still talking about it weeks later 🙂 I think it might be true love.